Congress Registration1st National Scientific Congress organized by Shifa Tameer-e-Millat University and Shifa International Hospitals Ltd.
. Seating Plan Venue Location . The National Scientific Congress – 2018 shall be held at Pak-China Friendship Centre located near the ‘Crescent and Star intersection’ on Garden Avenue, and with lush green Shakarparian hills in the backdrop. The Centre has a seating capacity of 814 and it is being considered as one of the most modren and state-of-the-art auditorium. It also houses eight conference halls among which the largest one has seating capacity of 250 people, besides three general purpose halls. It has ample lobbies and dedicated space for displays/stalls and exchibitions. It has dedicated and ample parking facility both inside and outside the main premises. 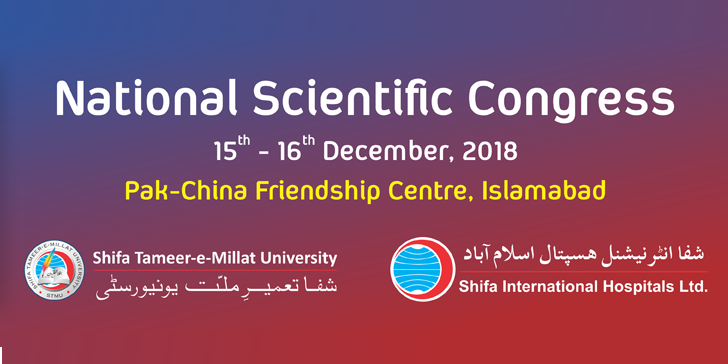 The National Scientific Congress is being organized in close collaboration between Shifa Tameer-e-Millat University (STMU) and Shifa International Hospitals Ltd. (SIHL) and shall be an annual event. Shifa International Hospital is a premier tertiary health care facility in Islamabad, accredited by the Joint Commission International (JCI). Shifa Tameer-e-Millat University (STMU) is a federally chartered University located in close proximity to its teaching hospital (SIHL) and imparts quality education in Medicine, Nursing, Pharmaceutical Sciences, Rehabilitation Sciences, Medical Technology, Clinical Psychology and Professionals Education. The National Scientific Congress shall be an annual event organized in close coordination between Shifa Tameer-e-Millat University and Shifa International Hospitals Ltd. with a significant input from our collaborators. The core objective of the congress is to disseminate the practices, observations and outcomes of landmark trials and local research, new guidelines and innovations in the field of Medicine, Surgery, Pharmacy, Nursing, Biomedical and Allied Health Sciences. Terms & Conditions : All rights are reserved by the management of National Scientific Congress. Best Viewed at 1024 x 768 pixels and above. This Page loaded in 0.06149 seconds on Tue, Apr 23, 2019 (13:52).